Every few winters, several bird species abandon their normal wintering areas to our northwest, and move into Massachusetts by the thousands. While distantly related, redpolls, siskins, and grosbeaks all rely on food sources that go through boom and bust cycles, peaking and crashing every 3-6 years. When conifer and birch seeds are scarce in Canada’s boreal forest, these loosely-related species irrupt southwards in search of food. The core group of these birds are collectively called “winter finches,” and this year will be huge for them! This year, these sunset-yellow, black and white-patterned finches are the stars of the show. It’s been a few years since Massachusetts saw any wintertime movement of Evening Grosbeaks into the state, and the last major irruption was in the 1990s. Unlike many winter finches, Evening Grosbeaks seem equally happy feeding on several food types—both fruits and large seeds. They’ll come to feeders, but their bulky size means that they prefer large platform feeders and will avoid tube feeders. Their fruit-eating tendencies means that they often move south with two other frugivores, Bohemian Waxwings and Pine Grosbeaks, which may show up in smaller numbers this year. These finches specialize in eating birch catkins, and birches are the best place to look for them. Ornithologists predict a big redpoll incursion into the northeast this winter. 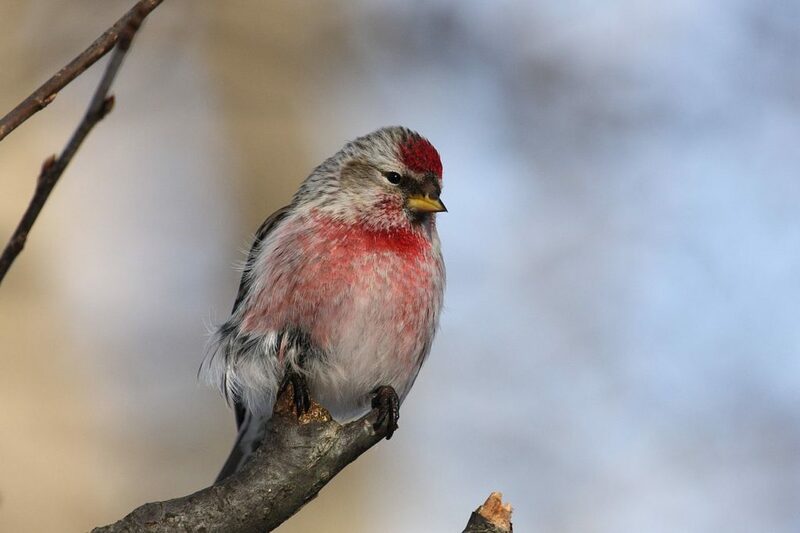 Redpolls got a slow start in Massachusetts this year, but are starting to show up in larger numbers, especially in the Northern and Western parts of the state. While technically not a winter finch, this species is nearly as nomadic, and this year is big for them. 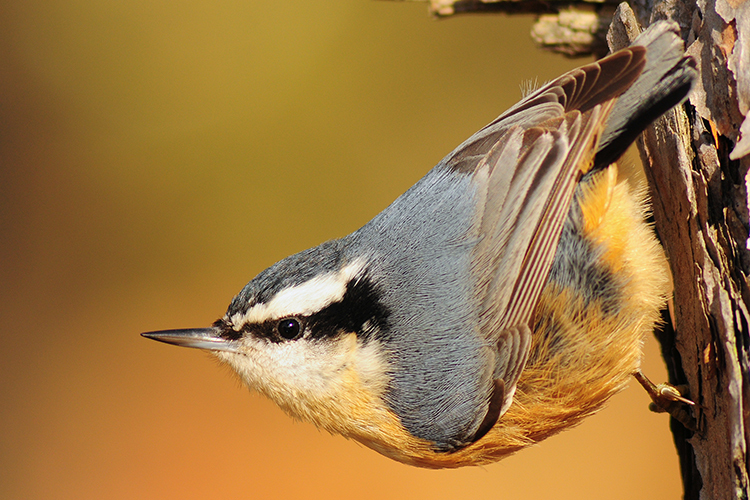 Their relative, the White-breasted Nuthatch, is a year-round resident and common backyard bird. Red-breasted Nuthatches made a very early southward movement this year, with many appearing as early as late summer, heralding a major incursion of wandering finches later in the season. Siskins are showing up in abundance right now! These small finches with yellow-streaked wings love small seeds. Hang up feeders filled with nyjer or thistle seeds to take advantage of their incursion. In addition to feeders, groves of spruce trees can be great places to look for seed-eating winter finches like siskins and crossbills. Redpolls are drawn to birch catkins. Fruit-eating finches often take well to ornamental varieties of crabapples, which bear fruit through the winter, so look for grosbeaks and waxwings anywhere large groves of these have been planted—which sometimes means office parks, parking lots, and gardens. Last year was an excellent year for cone crops in Manitoba, Ontario and Quebec, leading to increased reproduction for seed-eating birds. This means that while spruce seeds, birch catkins, and mountain-ash berries are scarce in Ontario and Quebec, there will be loads of hungry birds looking for them—and moving into the US in search of food. 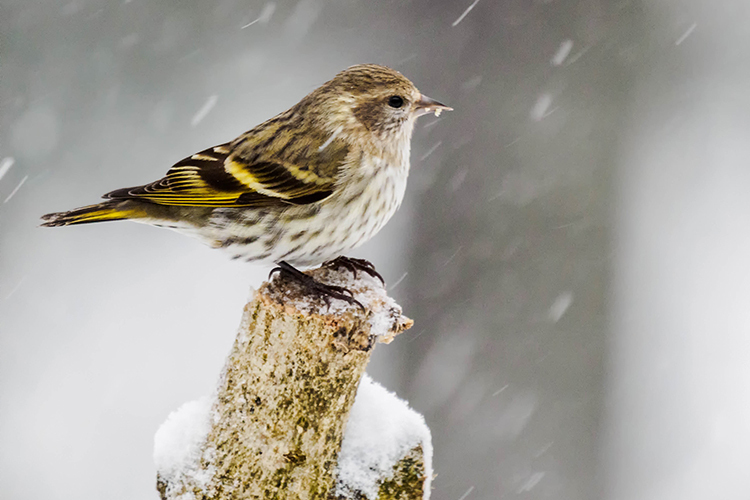 Birdfeeders do help birds survive harsh winters when food is scarce (though there’s a some This is a great time of year to put out black-oil sunflower seeds and nyjer seeds—two of winter finches’ favorite staples at birdfeeders. 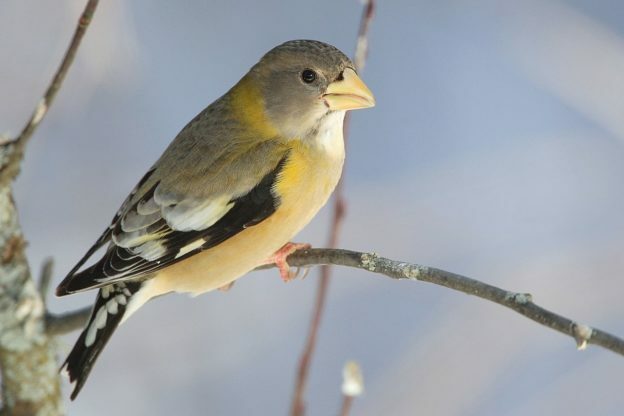 For a more in-depth look at this year’s incursion of Evening Grosbeaks and their shifting distribution in New England, check out our birding blog. This entry was posted in Nature Notes and tagged birding, birds, winter birds on December 5, 2018 by William Freedberg. I’m trying to date an event and I recall living there in the Boston are in the 1970s when a Little Gull showed up on Cape Cod, which I went to see. Not sure of your generation and whether or not there’s a way to look the record up for Mass. birds, but if there is, can you point me in the right direction, perhaps? Perhaps Ross’ Gull…..this species made quite a splash by landing in the Newburyport area. Birders came from some distance to view this species.